TodaysArt is an organization that revolves around the presentation and development of adventurous and contemporary visual arts and performing arts in the urban environment. Since 2005, TodaysArt has brought local and international artists, thinkers and audiences together worldwide. TodaysArt is a platform for talent and pioneers who explore the possibilities of new and often controversial forms of expression. TodaysArt has built up an impressive international profile over the past seven years by presenting and producing works that are developed through direct and intensive relationships with some of today’s leading artists. TodaysArt is a hub member of several international networks of independent festivals, including International Cities of Advanced Sound and related arts (ICAS), We Are Europe and Sound, Heterogenous Art and Performance in Europe (SHAPE). TodaysArt is consistently involved in international collaborations, by sending Dutch artists to creative centres across the globe and bringing international pioneering and/or talented artists to local audiences. From 2005 until 2012, the TodaysArt Festival took place annually in the city center of The Hague. Since 2013, the festival became slightly more nomadic. In 2013, the festival took place in the former building of the Ministry of Interior and Kingdom Relations. The 2014 edition was held in the Zuiderstrandtheater, a temporary theatre at the seaside, which TodaysArt officially opened. This year’s festival will take place at The Pier in Scheveningen. The Pier will be transformed into a festival site and will provide a stage for contemporary visual and performing arts. 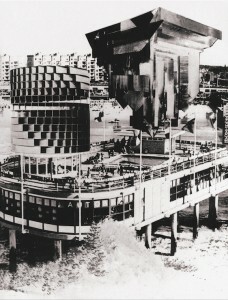 Inspired by this iconic building on the sea, ‘ZERO on Sea’ (an event planned on The Pier exactly fifty years ago by the ZERO art movement) and current developments in arts and society, TodaysArt will transform The Pier into a unique festival venue above the waves. The program features performances, club programs and installations. There will be interventions on The Pier, on the beach, in the sea and in the air. 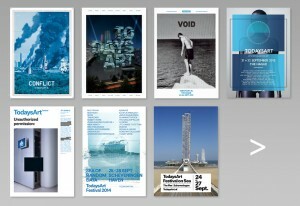 The festival program consists of several modules: Works, Performance, Club and Bright Collisions (symposium program). On Friday 25 and Saturday 26 September, The Pier will be the center of the TodaysArt Festival 2015. The Bright Collisions symposium program will take place on The Pier on Friday 25 September and Saturday 26 September. From Thursday 24 September until Sunday 27 September, you can experience 4DSOUND performances in the E.ON Electriciteitsfabriek. Exactly 50 years ago on the 25th of September 1965, a large scale multimedia open-air art manifestation was planned on the Scheveningse Pier by the radical and revolutionary art movement ZERO. This event never took place. Today, 50 years later, TodaysArt presents a festival, inspired by ZERO, with contemporary artists. Heinz Mack, fotocollage in ZERO 3. Halfway through the fifties, an influential, international art movement was born, called ZERO. 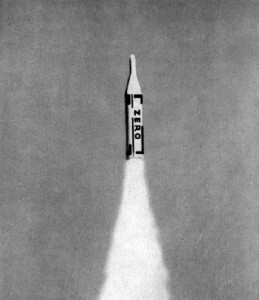 The ZERO movement was a progressive movement that wanted to separate itself from the heaviness after the years of war. ZERO is a group of young artists that found each other in their optimistic, utopic and innovative perspective on life. Artists from all around the globe where part of this ZERO movement, and also in The Hague, ZERO (Nul) had a strong representation. ZERO wanted to break with the established principles regarding what art should look like. The movement saw a strong relationship with society and its environment, – earth, wind, fire, water – and used new, common materials that had become available through technological progress. Revolutionary in that time was that ZERO-artists were as much ‘researchers’, ‘entrepreneurs’, ‘scientists’ and ‘curators’ as they were ‘artists’. In 1965, exactly 50 years ago, The Pier was the main site for a large scale, open-air multimedia art manifestation: ZERO on Sea, with plans for installations, performances, soundworks, music, video and even theater. However, because of financial difficulties and bad weather conditions, the event was postponed to spring 1966 and eventually even cancelled. For this year's Bright Collisions symposium, we are working together with Stedelijk Museum Amsterdam. The ZERO movement once again finds itself in the centre of attention. From the 4th of July until the 8th of November, there will be a large exhibition in the Stedelijk Museum, titled ZERO – Let Us Explore the Stars. The exhibition will explore how the artists connected to the movement, such as Armando, Heinz Mack, Henk Peeters, Otto Piene, Jan Schoonhoven, Günther Uecker, Lucio Fontana, Yves Klein, Piero Manzoni, Jean Tinguely, Yayoi Kusama, permanently changed the meaning and form of art. Recently, there were also exhibitions about ZERO in the Guggenheim Museum, New York and the Martin-Gropius-Bau, Berlin. Where the exhibitions focus mostly on the historical work and the unique archival material about ZERO, TodaysArt will look for the links between then and now, in direct collaboration with leading creators, artists and partners. One of the ways in which TodaysArt will do this, is by organizing a symposium together with the Stedelijk Museum Amsterdam: ZEROnow, A Symposium on the topicality or ZERO, will take place on the 24th of September (Stedelijk Museum Amsterdam) and the 25th of September (The Pier, Scheveningen). TodaysArt is a founding member of SHAPE (Sound, Heterogeneous Art and Performance in Europe) – a platform for popularizing innovative music and audio-visual art. Shape consists of 16 festivals and art centres and aims to support, promote and exchange innovative and aspiring musicians and interdisciplinary artists with an interest in sound. SHAPE attempts to present a variety of idiosyncratic music and sonic art from all over Europe, and provide audiences and professionals with insightful lectures, talks and workshops by experts in various fields telated to sound and performance. Each year the 16 involved associations will collectively choose 48 creatively strong artist and musicians to particiapte in a mix of live performances, residencies, workshops and talks across festivals and special events. SHAPE is a three-year initiative, co-funded by the Creative Europe program of the European Union. For some of the 4DSOUND programs reservations are required. This is only possible with a valid ticket. Please reserve per person and per session (you can't reserve for multiple sessions or persons at once). Please note! If you want to attend one of the NOQTURNL sessions it is only possible to enter the session between 23:30 and 00:00. Afterwards you can not enter anymore. Although we encourage people to stay during the night, off course it is possible to exit at any time. There will be beds, blankets and cushions available and it is possible to sleep. Make sure to dress extra warm as the factory gets cold at night! In addition, breakfast will be included. If you have a valid ticket, don’t forget to reserve for the session you’d like to attend! TodaysArt 2015 will take place at the seaside. The main venue of this year's festival is The Pier. 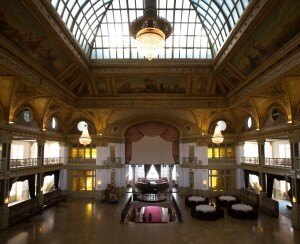 The festival will be opened with a performance at the Kurhaus, next to The Pier. 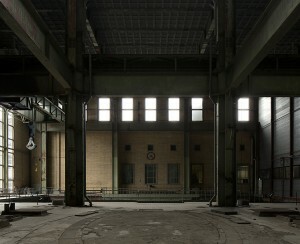 The 4DSOUND program will take place at the E.ON Electriciteitsfabriek. The Pier, an architectural and technical highlight from 1959, is not just an icon for the Netherlands; it is also well-known outside our country. Millions of people have memories of The Pier. In October 2014, The Pier was bought by two groups; KondorWessels Vastgoed (VolkerWessels) and DanZep. The Pier is the main venue of TodaysArt festival 2015, all different Islands will be used as part of the festival. In 2013 E.ON and Stichting Electriciteitsfabriek turned this industrial hall into an artistic hub. A large part of the factory is still active, but the former turbine hall (40x40x60 meters) has not been in use for 30 years. 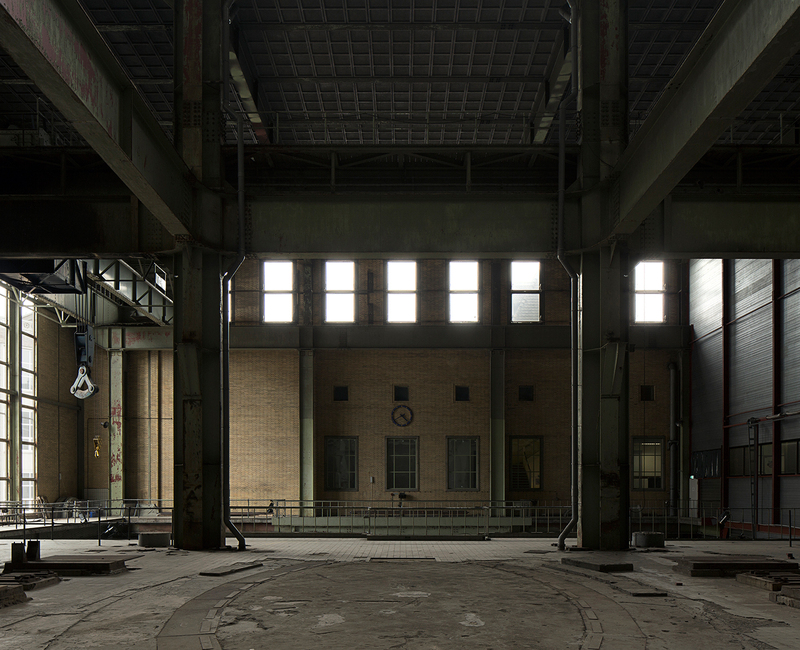 During TodaysArt the Electriciteitsfabriek provides the ideal space for the 4DSOUND program. The Kurhaus was build in 1818. This monumental hotel was always known for its allure and high-end guests. Nowadays it is part of the Amrâth Hotel Group and it still has one of the best sea views of Scheveningen. 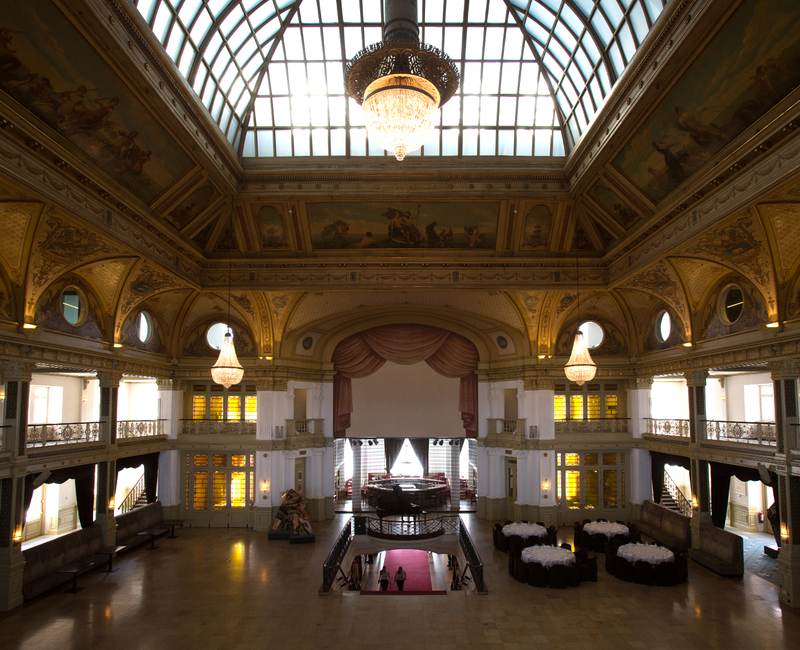 The Kurhaus will be the location for the official opening and the opening performances of TodaysArt 2015. All venues are easily accessible by public transport, by bicycle and by car. 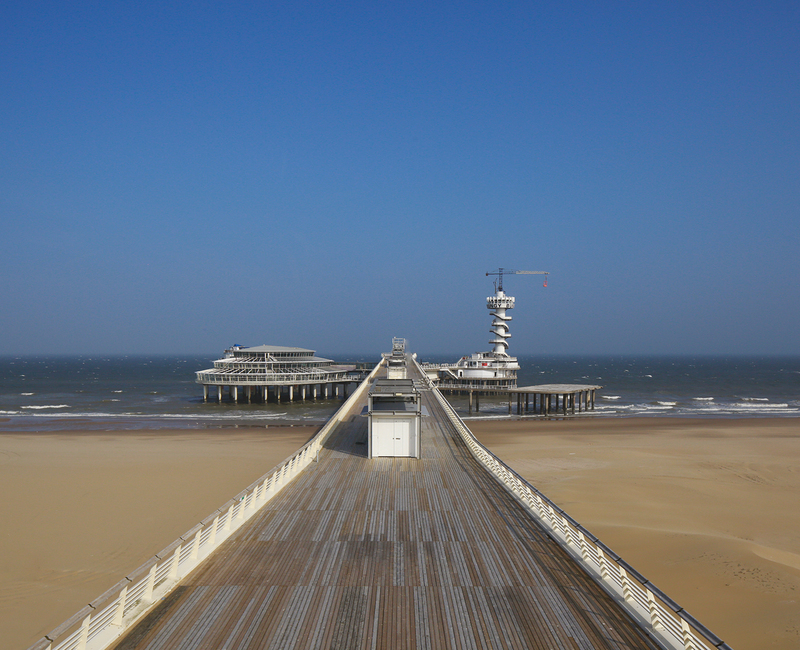 The Pier is easily accessible by taking the highway A4, A12, A13 or A44/N44 in the direction The Hague (Den Haag), following the direction Scheveningen-Strand or Scheveningen / Scheveningen Haven. Upon arrival, follow the directions to one of the many car parks: Zwarte Pad, Kurhaus, Nieuwe Parklaan or Scheveningen Bad. Since parking in Scheveningen is quite expensive, you can also use the Park + Ride facility. To get there, follow P+R Hoornwijck from the A4 or A13. Open 24/7 Mo – Fri €4 p.d. Sat + Sun €2 p.d. From Monday – Saturday Tram 15 will take you to Den Haag Central Station or Den Haag Hollands Spoor, from where you can take tram 1, bus 69 (replacing tram 9!) or bus 22 to The Pier. The Pier is easily accessible from Den Haag Centraal Station and Den Haag Hollands Spoor with tram 1. You can also take bus 22, to bus and tram stop Kurhaus. Important: Tram 9 is out of service and is replaced by bus 69 from Den Haag centraal station! From 01.00 until 05.00 you can take the night bus from Kurhaus to Den Haag Hollands Spoor. The bus leaves 13 minutes past each hour. The 4DSOUND program takes place in the Electriciteitsfabriek. This is easily accessible by car and public transport. The Electriciteitsfabriek is situated in a residential area. Parking is free until 18:00. Since parking can be quite costly you could also use to use the Park + Ride facility. To get there, follow P+R Hoornwijck from the A4 or A13. Open 24/7 Mo – Fri €4 p.d. Sat + Sun €2 p.d. From Monday – Saturday Tram 15 will take you to Den Haag Central Station, from there on take tram 3, tramstop ‘Elandstraat’. When taking tram 15 to Den Haag Holland Spoor, you can take tram 11 until the ‘Weimarstraat’ tramstop. The Electriciteitsfabriek is easily accessible from Den Haag Centraal and Den Haag Holland Spoor. When travelling from Den Haag Centraal, tram 3 (Randstadrail, direction Loosduinen) will bring you to tramstop ‘Elandstraat’ from there on its only a 5 min walk away. When arriving on Den Haag Holland Spoor, take tram 11 to ‘Weimarstraat’, 3 min walking distance from the Electriciteitsfabriek. Find detailed program descriptions, more about the venues and general information in this years’ program book, also available online. During the festival, various Kornuit x TodaysArt bars will be present on The Pier and in our two club stages Zuid -1 and Zuid +1, selling beer, wine and other drinks. In addition, the food huts in the Steel of The Pier will be offering different food and drinks options. The stands will be opened from 10:00 - 22:00 on Friday and Saturday. Read more below. De Pier Bar: Just after entering The Pier, you can find this bar where a variety of hot and cold drinks are offered. The Rough Kitchen: The food hut specialized in barbeque meat dishes offers a various range of snacks and sandwiches. Suggestion: a pulled pork sandwich with a local beer of your choice. Par Hasard: Par Hasard is the place to go to experience quality Dutch fried food. The snack bar offers fries, veal, cheese or shrimp croquettes and bitterballen. Shack: The street food hut by Reizende Sterren Foodtruck Crew, offers you a diverse menu, ranging from Hawaii-inspired meals and juices to snacks, drinks and cocktails. The Tornado Fries can be considered as Shack’s signature snack. Kust: With two huts, one indoor and one on the upper deck, Kust is the ultimate hang out for a coffee or a cold beer. It will also be the main bar during the upper deck party on Saturday afternoon. Pickles – Burgers & Wines: Considered by many as the best burger in Scheveningen, Pickles offers diverse sandwiches as well as a selected wine menu. PierZuid: A casual restaurant situated on the ground floor of the Zuid Island offering a wide variety of quality dishes and drinks. De Pier – Pannenkoeken & Poffertjes: Situated on the most North-West spot of The Pier under the Bungee Jump tower, this family restaurant offers pancakes, poffertjes and other Dutch specialities. We are happy to announce that we are once again working together with our partner F.A.S.T. F.A.S.T. is a unique surf village, campsite and hostel on the boulevard of Scheveningen within walking distance from The Pier. F.A.S.T. (Free Architecture Surf Terrain) provides a beach-hostel, camping and camper spaces, a bar, a restaurant, a surf shop and more. In addition, F.A.S.T. will be permanently closing this October so this is one of the last opportunities to spend the night at this unique location that is unique in the world! Here we've listed some of the many accommodation options near The Pier. Journalists, bloggers, photographers and other members of the press can submit an accreditation request to attend the festival. * At least 1 item will be published in your medium. * A copy of the item is sent to galina [at ] todaysart.nl in the proper format when the item is published. * Formats: text / article in .pdf – Pictures in high res .jpeg – video footage in .avi, highest quality possible. The accreditation for can be found; here.